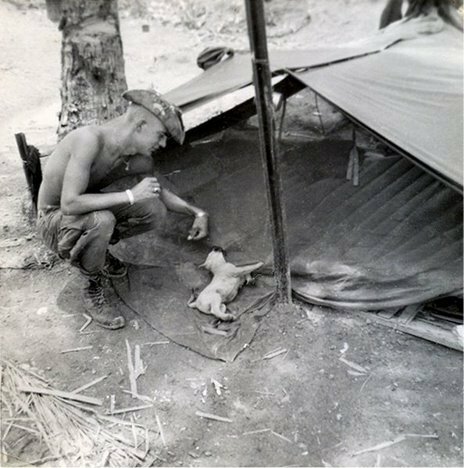 Cheyenne platoon adopted two puppies during 1967. Sergeant Bob DeLaughter, a man with a commanding presence and authoritative voice who everyone respected and admired, had a real soft spot for puppy dogs. 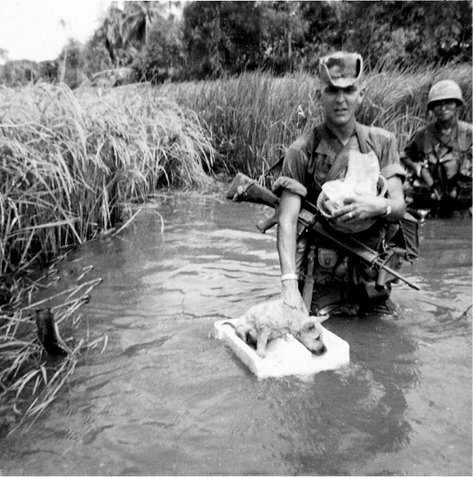 During a mission in a Bong Son village, Bob "rescued" a black dog and justified his action by stating that “this is one dog they are not going to eat". The dog was treated like a member of Bravo Company and allowed free run of our area. He had a penchant for crawling into one of our lieutenants shelter at night and chewing on his feet. As a result Bob was told to put the dog on a leash. Over the years, Bob and I have talked a lot about our black dog and although we both agreed that we lost him during a firefight, we could never agree on whether he had a name. 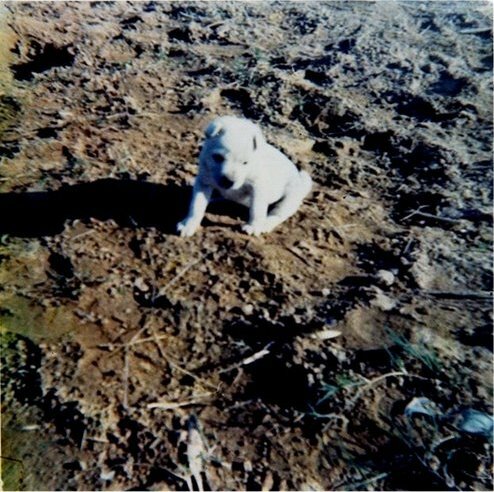 In the fall of 1967, a white puppy arrived at our company area in a sling load of gear delivered by Huey. Bob immediately took charge of the pup but refused to give him a name. Eventually after being pressed that the pup needed a name, Bob finally caved in and called him Sarge. As I recall everyone loved Sarge, and Bob even made a small raft for Sarge to float over rivers and tributaries. I sent a letter to my Aunt in Shelbina, Missouri, requesting that she bake some homemade dog biscuits for Sarge. The package arrived and since everyone believed that goodies from home should be shared, it was torn into and distributed to everyone but poor little Sarge. Someone even remarked what a good cook my Aunt was. Occasionally we had some beer to drink and Sarge became a real connoisseur. One night someone gave Sarge lots of whiskey instead of beer and that nearly killed him. drunk as a skunk. Bob claimed that Sarge walked backwards for a week after this drinking binge, however, I believe it was much less than a week. With the passage of time Sarge became experienced in airmobile operations and participated in many combat assaults. We were very fond of our dogs and they loved the C-Rations that we didn’t like, such as ham and lima beans. Unfortunately, we lost Sarge while on a mission in Bong Son. We were pulled out in a hurry and couldn’t find him before we left with the choppers.